Here are 18 interesting facts about water, one of the simplest and most abundant compounds in the universe. 2. 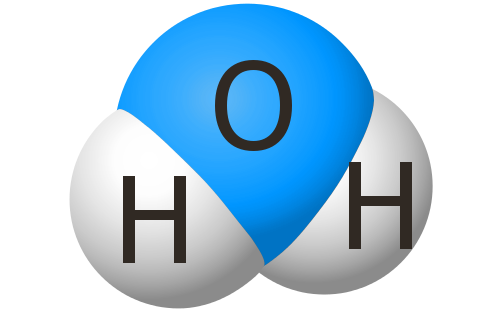 Water’s chemical formula H2O is better known than that of any other compound. 3. The speed of light in water is three-quarters of its speed in air. This speed difference causes light to refract (change direction) as it passes between air and water. The result of this is that things underwater viewed at an angle from land are not actually in the exact locations our eyes and brains suggest they are. 5. Low frequency sounds can travel huge distances in water with little decrease in volume. This allows whales to communicate over vast distances in the oceans. The low frequency calls of humpback whales can, in favorable conditions, travel thousands of miles in the oceans. 6. Water’s solid state is less dense than its liquid state. The result is that ice floats on water. This is extremely unusual – the opposite applies to almost all other substances. If ice were to sink in water, our world would be a very different place. Ice would accumulate at the bottom of the sea with huge implications for climate and life. Icebergs floating on water are only possible because of water’s unusual behavior. 7. Unusually, raising the pressure on ice lowers its melting point. When an ice skater moves across ice, the high pressure from the blades of the skates melts a thin layer of ice directly beneath them. This thin layer of water on ice has very low friction, resulting in very easy movement for the skater – either gracefully in the case of experienced skaters, or often an ungraceful fall for inexperienced skaters. 8. Water has a pH of 7. It is neutral on the acid-base scale. Water is neutral on the pH-scale. 9. Water has a very low molecular mass of only 18, made up of two hydrogens and one oxygen (1 + 1 + 16 = 18). On this basis, oxygen should be a gas a room temperature. If this were the case, life would be impossible. However, the electric charge within a water molecule is unevenly distributed. Although, overall, every water molecule is electrically neutral the oxygen atom is slightly negatively charged and the hydrogens are slightly positive. This results in hydrogen bonds forming between water molecules, dramatically raising water’s melting and boiling points to their well-known values. Hydrogen bonding between separate molecules has a dramatic effect on the properties of water. 10. Water’s polar bonds allow it to dissolve many substances, making it an ideal solvent for the chemistry of life. 11. Water covers 71 percent of our planet’s surface with the result that its color viewed from space is blue. Our blue planet with the moon crossing. 12. Water acts as a solvent for oxygen gas. If it didn’t there could be no fish. The colder the water, the more oxygen it can hold. 13. Water is vital for all known life forms. In humans, over half our body weight is simply water. Adult males need a daily intake of about 3 liters and females about 2 liters of water. This needn’t come from pure water: it can come from other drinks and, of course, much of the food we eat is mainly water. Water is a major component of most parts of our bodies. 14. Although pure water looks transparent, it is actually very slightly blue. 15. Water has high surface tension, allowing objects whose density should cause them to sink to float. Steel is denser than water and would normally sink. If the steel is light enough, such as the paperclip here, the water’s surface tension holds the steel on the outside of the water. 16. In addition to its high surface tension, water is rather sticky, which allows drops of it to gather in all sorts of places. Water surface tension and stickiness allow dew drops to form and gather, for example on this web. 17. Totally pure water is a very poor conductor of electricity. However, none of the water we encounter in our everyday lives is totally pure. Everyday water, which contains dissolved substances, is a rather good electrical conductor. 18. Water has a high heat capacity. It takes much more energy to raise the temperature of a kilogram of water by 1 degree than a kilogram of rock. You’ve probably noticed that when the sun beats down on rock, the rock gets much hotter than water does under the same sun. Water also releases much more energy when it cools than rock does. This is why the seasonal variation in temperatures in coastal areas and islands is usually much less than seen in the centers of continents.